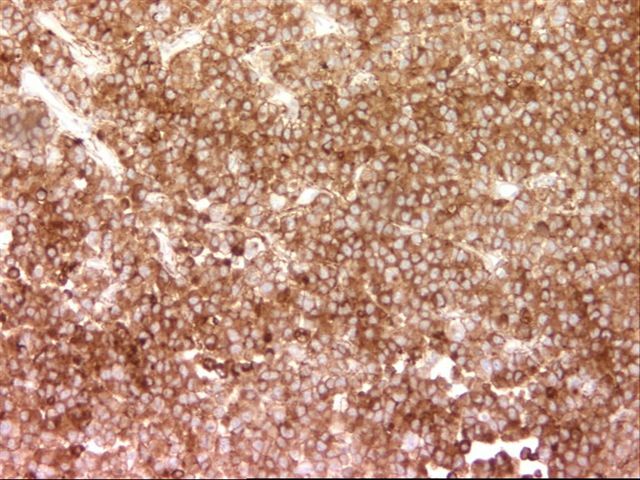 This week�s case is sponsored by Invitrogen.� The Zymed� EGFr antibody clone 31G7 is the most widely referenced clone and the industry standard for EGFr detection in formalin-fixed, paraffin embedded (FFPE) tissue samples. 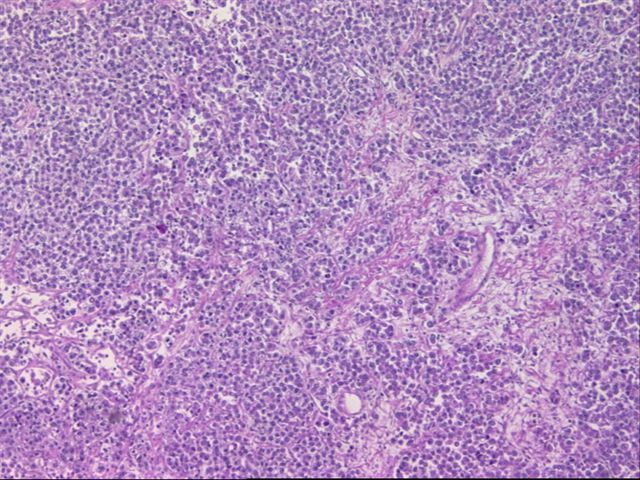 �Zymed�s 31G7 antibody is extremely specific for EGFr and does not react with the highly homologous c-erbB-2 (HER2) protein.� Invitrogen now offers the Zymed� 31G7 antibody clone as part of a convenient, standardized immunohistochemical kit for the detection of EGFr protein expression in normal and neoplastic tissue. 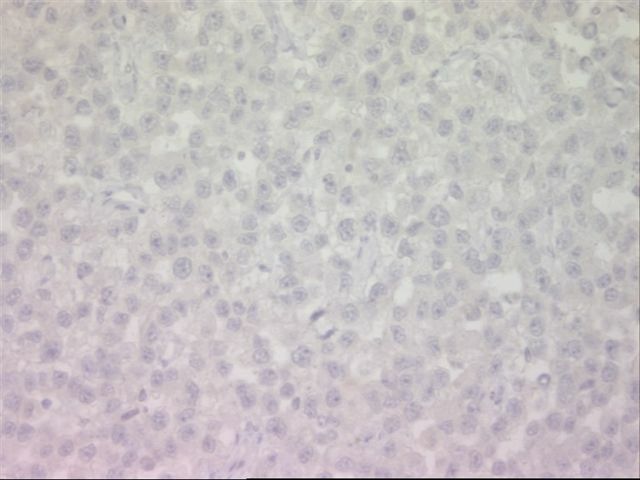 �Invitrogen�s Zymed� EGFr Kit is compatible with manual or automated immunostainers and offers the greatest flexibility with FFPE tissue samples.� For more information, visit www.invitrogen.com/antibodies.� Note: sponsors do NOT have access in any manner to email addresses or other personal information in the possession of PathologyOutlines.com. 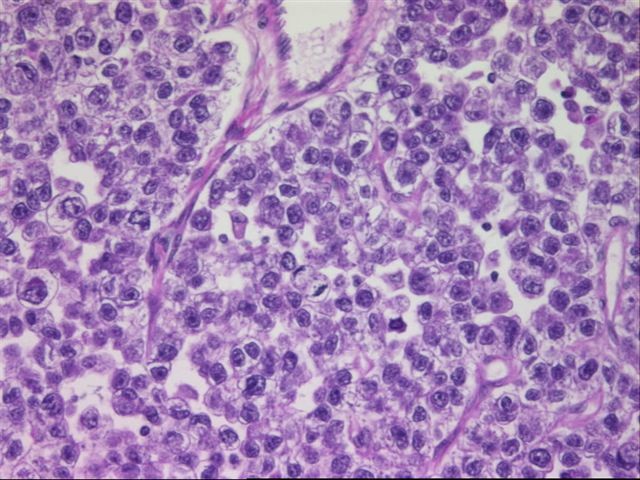 A twenty two year old woman had a large right ovarian mass, which was excised. 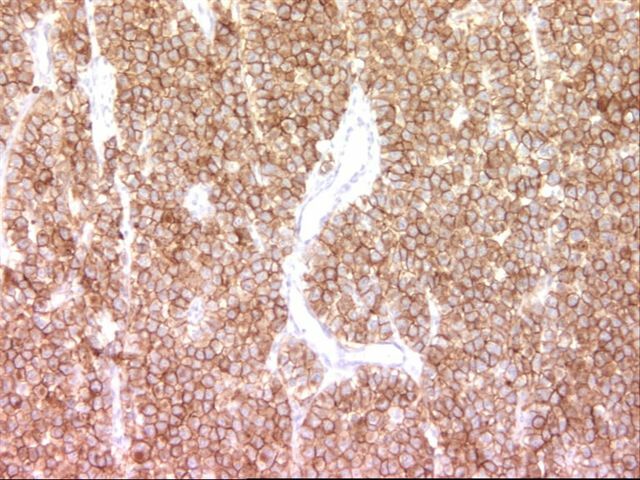 The immunohistochemistry was interpreted as PLAP positive, AFP negative, c-Kit positive. 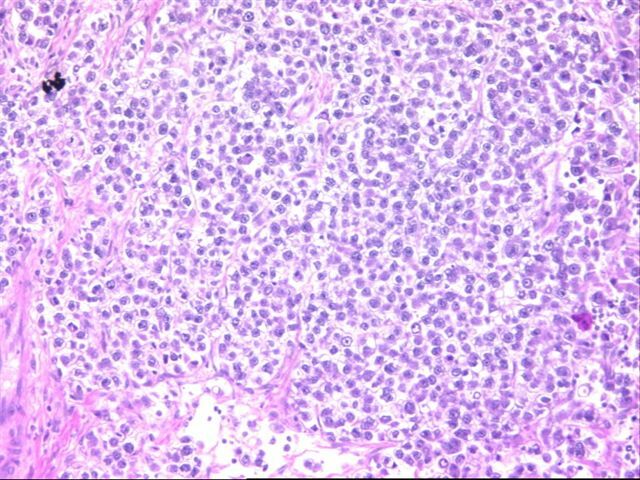 Dysgerminoma of the ovary is an uncommon tumor, representing less than 1% of ovarian malignancies.� They usually affect young patients, with 80% under age 30 years.� 15% have bilateral tumors.� Approximately 5% are associated with gonadal dysgenesis, androgen insensitivity or pseudohermaphroditism.� Some cases appear to represent progression from gonadoblastomas (Virchows Arch 2005 Jun 21 [Epub ahead of print]).� Patients with dysgerminomas typically present with low stage and have a 95% survival.� Metastases can occur to the opposite ovary, retroperitoneal lymph nodes or the peritoneal cavity, but often don�t affect survival.� Dysgerminomas are typically treated with surgery and chemotherapy, and not radiotherapy, which may impair fertility in these usually young patients (National Cancer Institute Treatment Summary).� Dysgerminomas may rarely transform to a yolk sac tumor (Mod Path 1995;8:881), and may be mixed with other germ cell tumors, such as choriocarcinoma, yolk sac tumor or embryonal carcinoma, which worsens the prognosis.� Thus, it is important to adequately section these tumors, and search for different looking areas of the tumor. 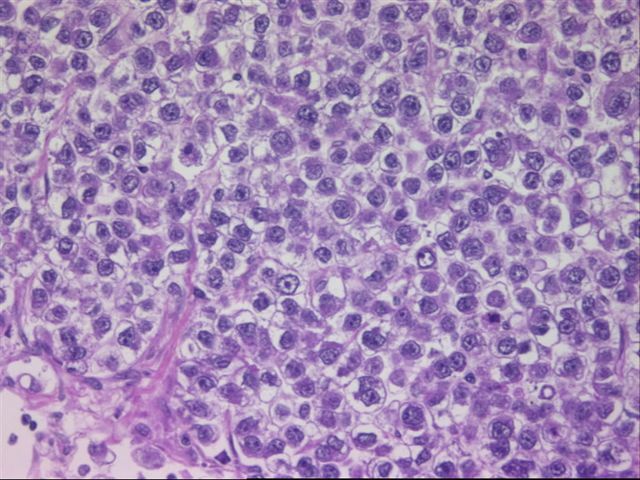 The differential diagnosis includes yolk sac tumor, undifferentiated carcinoma, clear cell adenocarcinoma (usually in post-menopausal women, PLAP negative), lymphoma, melanoma, granulosa cell tumor and metastatic breast carcinoma.� Careful review of the histology of multiple sections, special stains and clinical history are helpful in distinguishing these other tumors.� Dysgerminomas are immunoreactive for PLAP, c-Kit and vimentin.� They may be focally positive for hCG in giant cells, and focally positive for cytokeratin.� They are negative for AFP.� Recent reports indicate that Oct4, a transcription factor involved in the regulation of pluripotency during embryonic development, is sensitive and relatively specific for dysgerminomas (AJSP 2004;28:1341).